A list of conditions to unlock various endings in Catherine: Full Body, including the status of the player's Karma meter and answers to questions. The ending that you get in Catherine: Full Body depends on two variables: the Karma Meter (Angel/Devil) and the responses you chose on the 9th Night. The Karma meter’s level varies depending on Vincent Brooks‘ answers to questions thrown at him by the Troubled Stray Sheep patrons both in the bar and in the landing area of the different nightmare stages. As for the 9th Night, Vince needs to respond to the last four questions asked to him. Answering these questions would simply move his Karma Meter to an extreme level. If you want to see all the endings of the game, save your data before answering the 9th Night final act questions. Then, simply reload the game numerous time to go through all of them. Question 2 – “Do you wish for a peaceful life?”. Vince can answer either “Yes” or “No”. Check our endings section to decide on the specific ending you want. Question 3 – “Do you wish for the excitement of chaos?”. Vince answer either “Yes” or “No”. Check our endings section to decide on the specific ending you want. Question 4 – this question is structured based on your answers on Questions 2 and 3. Check our endings section to decide on the specific ending you want. “Nighty Night” trophy obtained. Katherine will still leave Vincent. “Just Like Old Times” trophy obtained. Vincent and Katherine gets together again. “Starting a New Life” trophy obtained. Vincent will marry Katherine with an additional wedding scenes. “Women are the Ocean” trophy obtained. Check our 4th Katherine Ending guide for more information. “Hit the Road, Vincent” trophy obtained. Vincent asks Catherine to marry him but she declined. “Sleepless Nights” trophy obtained. Catherine and Vincent gets married. “Lord of the Night” trophy obtained. Vincent marries Catherine despite the hesitation of her father. They spend time in the underworld and later on be surrounded by female demons. “Time Bride” trophy obtained. Catherine rewrites Vincent’s high school memories and includes herself in it. 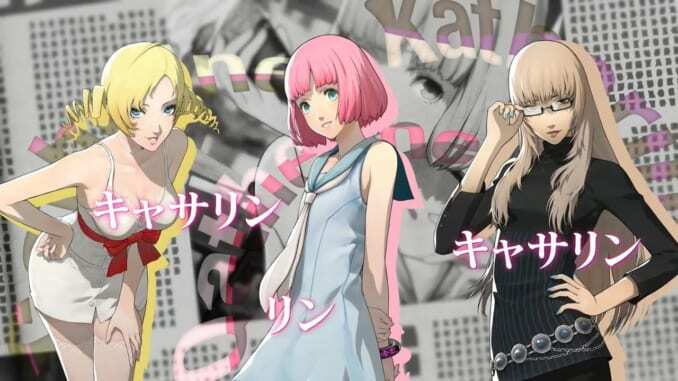 Check our 4th Catherine Ending guide for more information. In order to reach the Rin-related endings, the player needs to trigger the Rin (Qatherine) alternate route. ※ Responses are loosely-translated from the Japanese Version. We will make better translations once we have the official English version of the game. “Until We Meet Again” trophy obtained. “The World is for Two People” trophy obtained. “Whatever, Buddy” trophy obtained. Vincent will decline all of the ladies and ask Boss for a loan. He’ll use the loan for a wrestling match bet. “A Life Without Regrets” trophy obtained. Vincent will decline all of the ladies and ask Boss for loan. He’ll use the loan for a wrestling match bet. He eventually wins and travels through space.